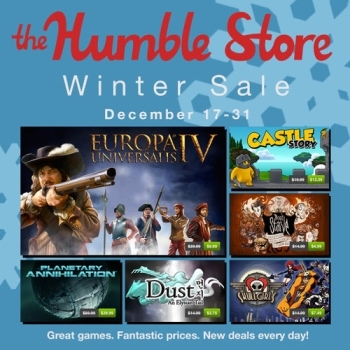 Two weeks of sale prices on the Humble catalog include daily discounts of up to 75% on games like Planetary Annihilation, Don't Starve, and Europa Universalis IV. The latest addition to the Humble family, the Humble Store opened its digital doors in November. Like the Humble Weekly Sale and Humble Bundle, part of the proceeds from the Humble Store goes to charity. The digital storefront offers more games for sale at once than could fit in a Humble Bundle and games are sold individually. The Humble Store went toe-to-toe with the Steam Autumn sale in November. Now, the first ever Humble Store Winter Sale has launched. The sale will run for two weeks, beginning December 17 and ending December 31. Most games in the Humble Store are on sale, with greater daily discounts on select titles every 24 hours. The biggest discounts for the first day of deals are 75% off grand strategy game Europa Universalis from Paradox Development Studio, 66% off wilderness survival game Don't Starve, and 75% off action RPG Dust: An Elysian Tail. The first round of daily deals also includes discounts on 2-D fighting game Skullgirls, Steam Early Access sandbox adventure game Starbound, and preorders for creative strategy game Castle Story. Smaller discounts are offered on Overgrowth, a 3D action game about ninja rabbits that is currently in alpha, and Samurai Gunn, a fast-paced brawler featuring samurais with guns. Planetary Annihilation, the real-time strategy game funded with Kickstarter and currently an early access game on Steam, is also marked down 20%. The first day of deals will end at 2 pm EST on December 18. As always, sales from the Humble Store are split between charity (10%), the game creators (75%), and the Humble tip (15%), which goes to cover hosting and other costs. The charity proceeds are split equally between the American Red Cross, Child's Play Charity, Electronic Frontier Foundation, World Land Trust, and charity: water.